David Robinson may float under the hobby radar, but his NBA success and clean-cut image make him one of the most -respected players in NBA history. The seven-footer is known as "The Admiral" because of his previous military service, and David Robinson cards and memorable make for an appealing budget option for collectors. Shop for David Robinson Cards on eBay. Despite not playing organized basketball until his senior year of high school, David Robinson joined the college basketball team for the US Naval Academy. An impressive growth spurt and considerable college success put him on the NBA radar. He was taken first overall in the 1987 NBA Draft by the San Antonio Spurs, but had to wait two seasons to fulfill his military obligations. Officially beginning his NBA career in the 1989-90 season, David Robinson got off to a fast start. 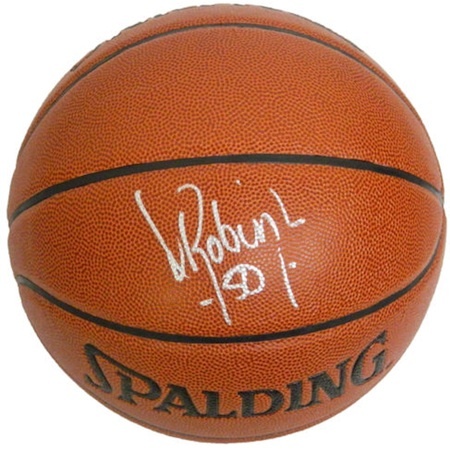 He was named the 1989-90 Rookie of the Year and upon his retirement, Robinson was a ten-time All-Star, two-time NBA Champion, and was the NBA MVP in 1995. David Robinson was also part of the gold medal Olympic "Dream Teams" in 1992 and 1996. Playing alongside Tim Duncan for six seasons, the two big men formed one of the most impressive front courts of the era. Robinson was inducted into the Basketball Hall of Fame in 2009. David Robinson has been a frequent signer for card products, and has signed for Upper Deck, Panini and Leaf in recent years. Because of this, his autograph values are reasonable and in good supply. He has only one rookie card, which can be seen below. Prices have come down a lot over the years and this David Robinson rookie card can be found for a few dollar now, but when it was released, this was THE card to have. Although NBA Hoops was a new brand, 1989-90 Fleer did not include Robinson in their checklist. 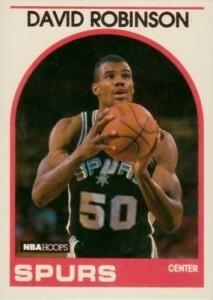 Due to this, it is the only David Robinson rookie, and maintains its appeal despite the limited value. The card is technically a short print, but the production numbers are so high, it really does not matter. 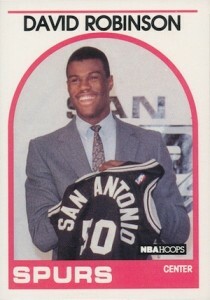 NBA Hoops issued a second David Robinson card in Series 2, which shows a live-action image. 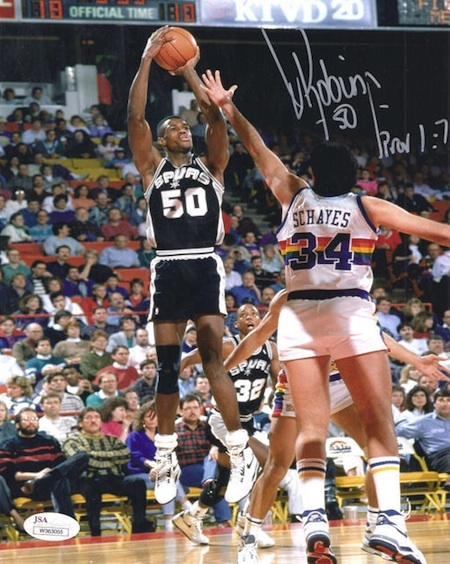 Below you will find an example of what David Robinson's authentic signature looks like. This can be used as a first point of reference for determining the legitimacy of autograph memorabilia, but is not a substitute for having your items authenticated by a well-respected professional autograph authentication company. Reputable authentication companies include JSA, PSA, Panini Authentic and Mounted Memories, to name a few. 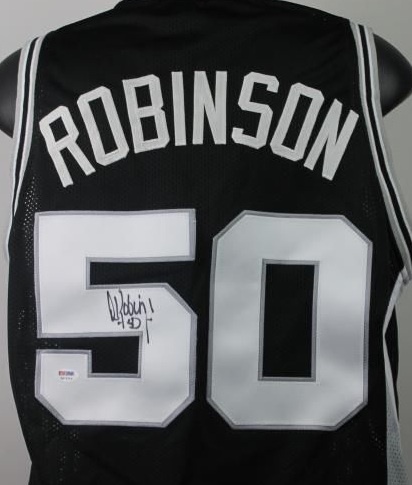 David Robinson has a solid signature and it has remained consistent for most of his career. The first name consists of only a "D" and the remainder of the name is implied. The large "R" continues down with a long line that forms the front of a bracket for his jersey number. The last name is clear as "Robin" and the remainder is implied. Current signatures appear to end the name with something that resembles a printed "L". 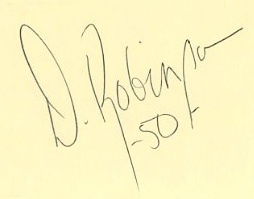 Another line occupies the end of the "50" below the signature.